The exterior is constructed from a heavy gauge steel angle framework with sheet panels finished in hammer blue paintwork. The furnace lining consists of high efficiency graded low thermal mass insulation and refractory materials. Refractory brickwork provides a hardened surface to the chamber entrance and solid support for the hard wearing removable tiles that form the furnace hearth. Double wall case construction together with ventilation fan ensures that the furnace casing and door remain relatively cool. The door affords obstruction free access to the work chamber. A selection of different door types are available (vertically lifting type illustrated). 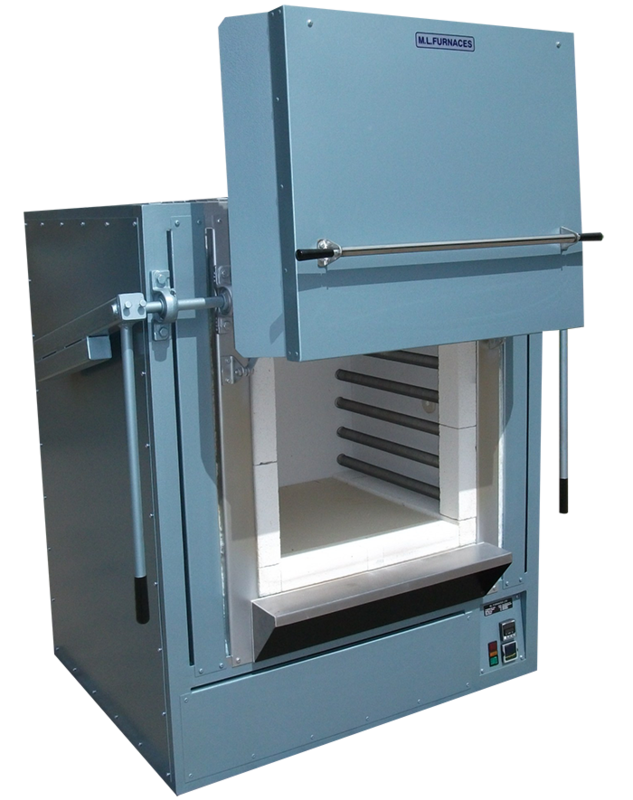 Heating: The heating elements are high quality free radiating wire spirals supported on each side of the furnace work chamber, for temperature uniformity and thermal efficiency. Power to the heating elements is controlled by solid state relays for accuracy and reliability. Larger versions can be made to order. Options include: alternative models of temperature controls / programmers / recorders / communications / timers / floor stands / chimneys / inert gas connections etc. H* x W x D 400 Volts AC.